You can download the source code of the application from here. And you can see a sample demo here. damnit, I guess I have to step up my game. 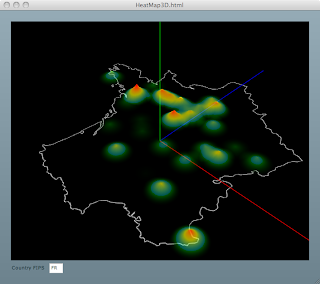 Aight, fine, I'll start working on animated 3D heatmaps of millions of datapoints. Very cool - Cannot wait to see what you will come up with - Fresh ! Great 3D dem0! One question. Is this done in flex 3 and if so how do you load the source into flex 3? Yes - this was done using the flex3 sdk - eh...by loading the source, flex builder helped - or you mean the source of the data - then it is embedded. I am having problems getting your source code into Flex 3. Do you have to import it? Or copy it into a new project. Does it require the ESRI swc? Does it need anything from the PaperVison Framework? Thanks for your help. Thanks for the fast responce Thunderhead. I have been able to get the demo into Flex 3 thanks to your instructions. I however am getting some errors. The PaperVision greatwhite does not seem to exist on the paper vision repository. The closest match to your demo seems to be the trunk for cs4. I am getting errors related to the CameraObject3D.as. What version of PaperVision do you suggest? Thanks for the link to the proper version of Papervision. Worked great. Fantastic potential here with ESRI,Flex and Papervision. I have a few questions: I noticed that the full world shape file slowed the performance compared to your online demo. Is this due to the the use of a different shape file or did you reduce the data for the online version. Also I am not sure but i think i may have heard you on a online interview on one of the flex community sites or blogs. Are you the the thunderhead that works at ESRI and if so is there a way to talk to you in your official capacity about a project we are considering ArcGis server for? Yes, that was me :-) and yes I do work for ESRI and can be reached at mraad@esri.com - hope to hear from you. This application works great, no problem loading into Flex. But as Robert mentioned, it does seem to be quite a bit slower running locally than the online version you have posted. Any suggestions to improve the speed? Ha, sure enough that helped. One more question, I'm trying to figure out how I can just load a specific shapefile rather than using the FIPS to select. I tried embedding my file where you have cntry06.shp, but nothing will show up until I select a country via FIPS. How do I force the embedded map to display? I know I need to either edit the DBF file or the DBF parsing in the project to get it to work correctly, but I'm not quite sure the best solution. Thanks.